So sweet! Hope she has a great first day! Love it! Such a great idea putting what she wants to be on that cute sign you made, too! :) I hope she had a great first day!! last year she wanted to be a rockstar! Ahhh, I love it! What a beautiful photo, and I love that she wants to be queen! OMG she is so cute! That backpack is sooooooo adorable! I would even use it!! Where's it from??? haha, she always says things like "when i am queen i will turn all of the granola bars into candy bars"
She's adorable! 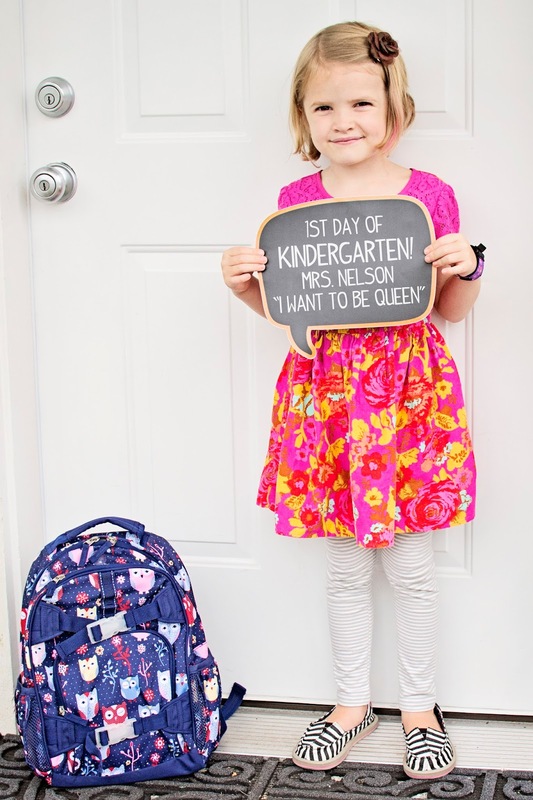 So glad she was able to start school and freaking ADORABLE that she wants to be queen. UGH! I wish we had a pottery barn close to us! Boo!! So online shopping it is! i ordered online too! we don't have one close to us and you seem to get a better deal. plus they usually have free shipping deals! Well that's what I'll be doing! !